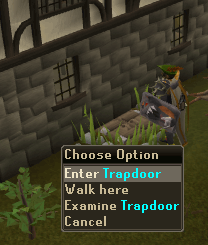 Enter the trapdoor north of the house located north of the furnace in Lumbridge. To begin the quest head to Lumbridge and go behind the house north of the furnace in Lumbridge. You should find a trapdoor, enter and you'll be in Darren's cellar. Speak with Darren, the rather small man, and choose between skipping his explanation or listening to it. Either way is fine, pick one and continue on with the conversation. He'll tell you he is recruiting people for something and needs money to begin turning the cellar into a headquarters. His plan to earn money is to steal a chalice from the Lumbridge bank, however, getting it won't be so simple. Agree to help him and you'll have started the quest. Darren will want to know the length of your abilities before he recruits you. First he'll want you to pick the pocket of a nearby dummy as swiftly as possible. 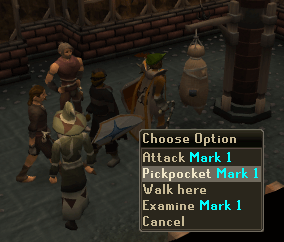 Right click pickpocket on Mark 1 and Darren will be impressed by your skill. If your Thieving level is high enough he will want you to teach him a thing or two. You can skip that and just get on with the quest or teach him for an extra 2,000 Thieving experience. He'll tell his right-hand man to meet you at the castle. Exit the cellar and head towards the Lumbridge courtyard. Robin should be on the south end of the castle inside the walls. Talk to him. He'll tell you the owner of the chalice left and took the chalice with him somewhere into Lumbridge Swamp. Head into the swamp and find Father Urhney whose house is along the south coast of the swamp. Try and pickpocket him, but you won't be able to, as he is too alert. So instead, simply talk to him and ask him about the chalice. Try all the chat options and finally use the "bye" option. You'll tell yourself to go back and ask Robin for help. Once you're back with Robin his new plan is to set a small fire outside his window. Robin will give you a tinderbox, now all you need to do is grab a hatchet, you can get one for free at Bob's store on the southeast side of the courtyard. Now go back in the swamp, cut one of the dead trees there and head to Father Urhney's house. Light a fire outside one of the windows. Once the fire is lit, run inside and ask Father Urhney about the chalice again. You'll get the chat options again, except one is now "FIRE, Fire!". Use that and then pickpocket Father Urhney to obtain a key. Next, head over to the Chalice's display case and open it. You'll then have the chalice. Now head back to Darren inside his cellar and give him the chalice by using it on him. He'll grant you access to his guild, the Thieves' Guild, and give you pamphlets. Congratulations! Quest Complete! 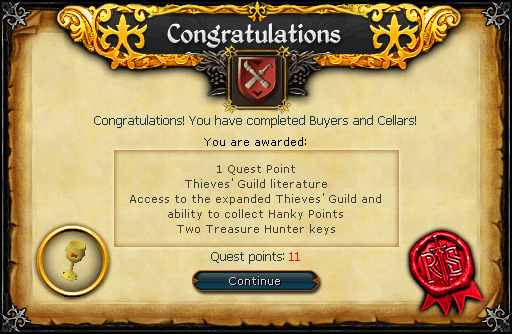 After exiting the quest scroll, in your inventory you should have gotten three pamphlets. Read each of them for 175 Thieving experience per pamphlet. This will total to 525 Thieving experience for all three. [^] Speak to Darren in his cellar. 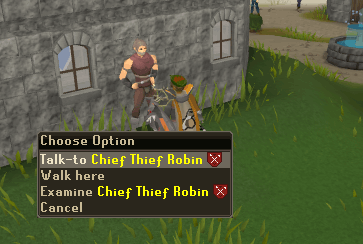 [^] Speak with Robin near Lumbridge Castle. 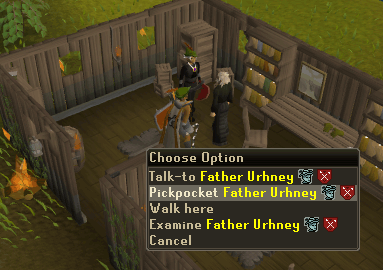 [^] Find Father Urhney in Lumbridge Swamp. [^] Attempt to pickpocket Father Urhney then speak with him. [^] Head back and speak with Robin about the new plan. [^] Fetch a hatchet of some sort and cut down a tree in the swamp. [^] Light a fire outside Father Urhney's house. [^] Distract Father Urhney and pickpocket him for a key and then steal the chalice. [^] Take the chalice back to Darren.